High-speed steel (HSS) drills in a hobby pin vise. This takes forever. HSS drills in a Dremel drill press. Even at the lowest speed, the drills overheat and dull quickly on the glass fibers in FR4. Carbide drills in a Dremel drill press. I'm sorry to report that Dremel moto-tools, never laboratory precision, have seriously fallen in quality over the past 20 years. Bearing quality is unpredictable, and so runout is often poor. Collets are made from aluminum, which deforms easily and contributes to off-axis movement of the drill. These qualities alone rule out the Dremel from serious use as a PCB drill spindle, and the drill press attachment is even worse: inherently wobbly and misaligned, causing brittle carbide drills to quickly snap. Don't even try this combination--if it works, you're lucky. 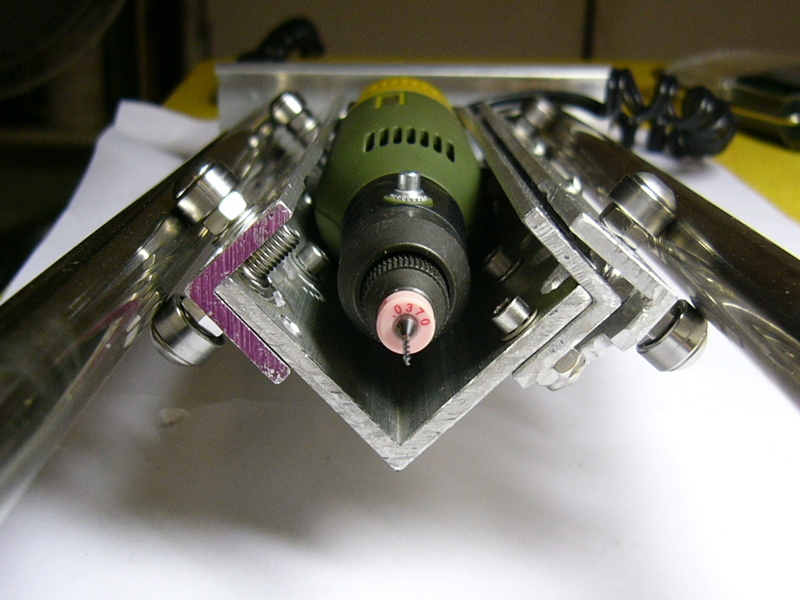 HSS drills in a conventional drill press. Slower speeds improve the life of the drills, but they still dull quickly within 100 holes or so. Chucking tiny drills is problematic; I've usually had to improvise a makeshift collet from a piece of brass tubing. Carbide bur in a dental handpiece. The last was an interesting experiment. I asked my dentist if she had any dental handpieces which had been removed from service; on my next visit, she very kindly provided a sterilized Midwest Quiet-Air handpiece, compressed air umbilical, and a selection of carbide burs, free of charge. The Quiet-Air supposedly delivers a very high maximum speed (400,000 RPM) at 30 PSI. It uses a standard 1/16" shank friction-fit dental bur. Carbide burs are widely available and reasonably inexpensive new if you know where to look. I purchased a set from Lasco Diamond Products to supplement the collection of used burs. Of course, any dental practice generates large numbers of used burs in a wide variety of styles which are no longer suitable for mouth work but have plenty of life for your drilling and shaping needs. Just ask! The burs are extremely tough--they absolutely must not break apart in a patient's mouth--and come in common PCB hole sizes such as 0.8 and 1.0 MM. Connection of the handpiece was straightforward. The Quiet-Air umbilical has connections for air, air return, water, and fiber-optic light pipes; only the air connection is required. I used a cheap regulator to limit pressure to 30 psi. I could get about 8-10 minutes of drilling action from a 5 gallon compressed air tank. The handpiece was very effective at drilling. The burs dropped through the PCB material like a knife through soft butter. There were a few disadvantages, however: the burs were made for shaping, not for drilling, so they were equally effective in any direction. They also left a tiny but annoying burr around the edge of the hole. Keeping the handpiece aligned with the board was difficult, since it was perfectly happy to track sideways and grind out an oval hole or worse. I sought to constrain its motion to a single linear axis, but the ergonomic handpiece design made mounting to any kind of press mechanism problematic. 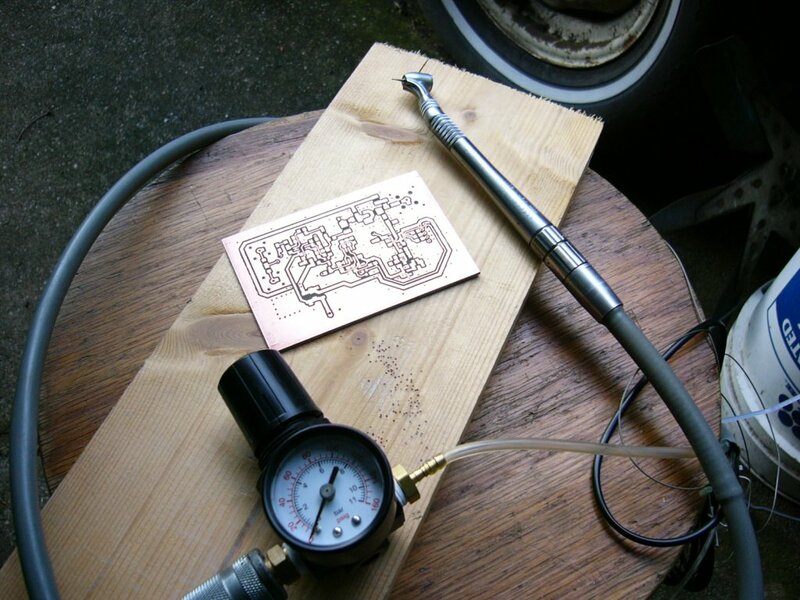 I performed some very precise freehand drilling with this tool, but there had to be a better way. 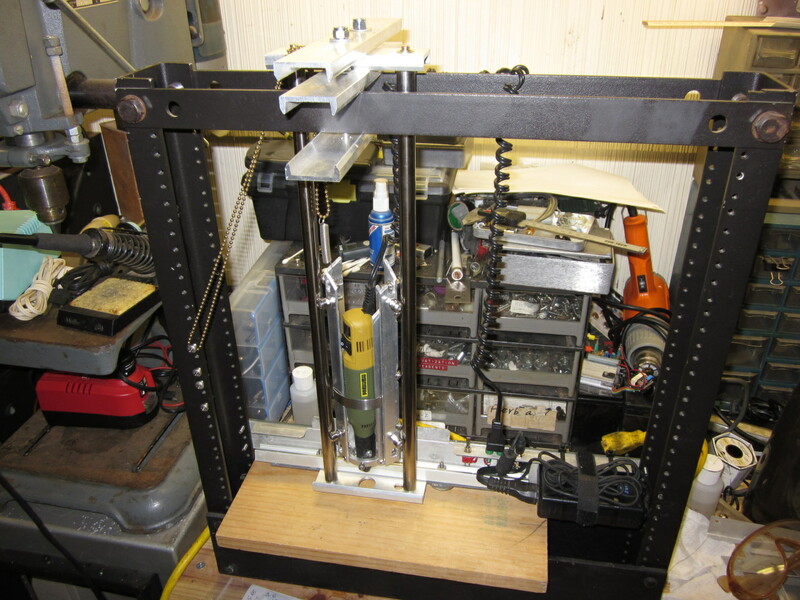 In 2009 the website Hack a Day published a very favorable review for a precision hobby drill press manufactured by Proxxon, a German company I'd never heard of. 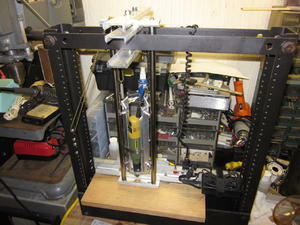 This drill press seemed ideal for PCB work, but it was expensive--$200+. Looking for a cheaper option, I browsed the rest of their product line. Proxxon makes a series of Micromot moto-tools similar to the Dremel line, but of reportedly superior quality. Bearings are very precise, with minimal runout; bearing housings are typically cast metal rather than ABS plastic; collets are a steel 3-jaw design; and the nose of the tool is a machined metal surface suitable for rigid mounting, a critical feature noticeably absent from Dremel's offerings. While the Micromot line commands a price premium over the Dremel, reviews are uniformly excellent. Most interesting for my purposes was the Micromot 50, a miniature handpiece powered from 12-18V and yielding 20,000 RPM max--a suitable speed for carbide PCB drills. This tool is also comparatively cheap if you buy it sans power supply, around $35 from online retailers. A note on Proxxon's slightly confusing product numbering scheme. The Micromot 50 has a simple on/off switch and requires an external speed controller unless you want single speed operation. The 50/E has an integrated electronic speed control. Shopping on Amazon.com, I was confronted with a few different options and corresponding part numbers. Here's how they break down. Note that the power supply must be made or purchased separately; the bare tool has a power cord terminated with Proxxon's proprietary 3-pin DC plug. 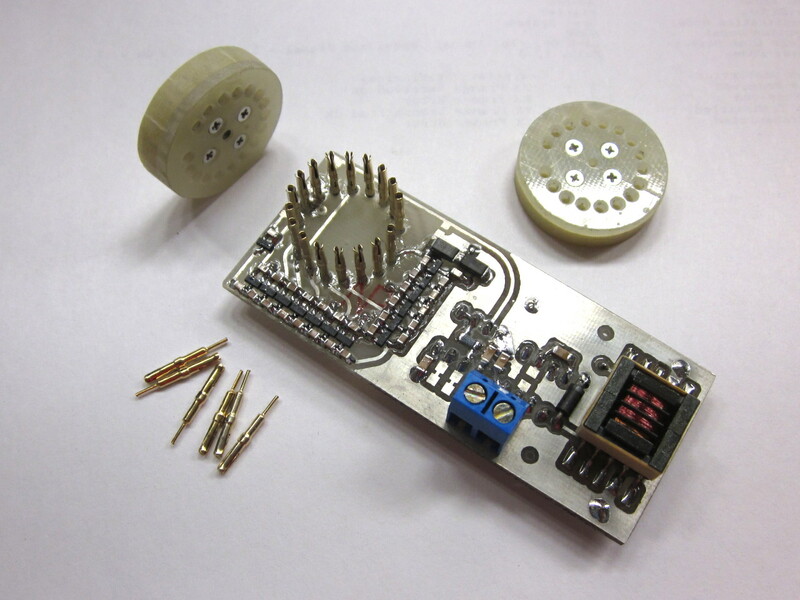 After a typically banal exercise in Adding to Cart and order fulfillment, I received the 28500 and determined that it would make an excellent PCB drill motor. Use cheap, commodity parts with high innate precision. Use self-aligning techniques wherever possible. As an example, a spherical ball will self-align in a V-groove. Leave sufficient slop in mounting holes for the assembly to be trued against a flat surface as fasteners are tightened. The core of the design was a pair of hardened steel rods from two identical ancient dot-matrix printers. These were the same diameter and the same unnecessarily extravagant length; had threaded holes and a mounting step at the ends; and were extremely strong and precise. To join them I used two pieces of 1/4" thick aluminum C-channel with holes drilled to the diameters of the mounting steps, as consistently spaced as I could manage. While the final assembly was very rigid and the rods seemed parallel, I decided the drill carriage would need spring-loaded bearings to eliminate any play. For bearings I tried salvaging sealed ball bearing assemblies from hard drives, but found them difficult to extract without damaging the finish of the critical outer race. So I coughed up $12 or so for 8 miniature bearings from a local hobby store. The concept for the carriage was a box constructed of extruded aluminum angle. Aluminum extrusion isn't known for guaranteed tolerances, but the stock was consistent enough for this application. 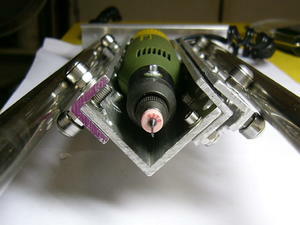 The drill motor's round mounting surfaces would self-center on mounting shims to one corner of the box. Bearings would be mounted on both surfaces of another corner, creating a v-shaped bearing surface. 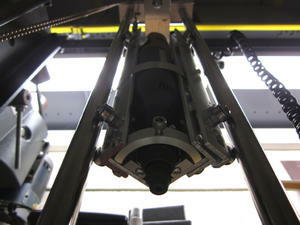 This would self-center and ride on one of the steel rods, giving a guaranteed reference point for the Z axis. Another set of bearings would be fastened to a rail spring-loaded against the box, riding on the other rod. I encourage you to view the pictures below, as they're worth a thousand words of further description. I drilled the mounting holes for the bearings such that the bearing edges were in the same plane as the perpendicular edge of the angle. I then assembled everything on a flat surface, achieving a very consistent bearing geometry. The pairs of bearings were staggered to assist in this process. The spring-loaded rail was so ingenious I can't even describe it, but actually performed very poorly. Adequate tension was applied, but tolerances were loose enough that the rail could rotate relative to the main carriage body. I added some rubber grommets to keep the assembly stiff under normal use. At this point the project languished for months while I tried to figure out how to mount the motor securely in the carriage. Finally I became so frustrated by lack of good PCB drilling capability that I flew into an all-night frenzy and completed the project using whatever crap I had on hand: a $5 steel equipment rack from a hamfest for the frame, more aluminum C-channel, parts from old hard drives, and miscellaneous other hardware. Mounting the motor was tricky. The nose of the Micromot is a machined steel collar, but the body is ABS plastic with perceptible dimensional variance. If the motor was not exactly inline with the Z-axis, the drill would snap from side-loading as it descended through the workpiece. I added aluminum blocks to the carriage to approach the diameter of the collar, and used stainless steel shims for final spacing and to keep the collar from bedding in to the blocks. Once the collar was tightly clamped, a hose clamp kept the plastic upper body secure. Although I have no way of measuring the axis of the drill relative to the carriage, it seems to be extremely on-axis. Final touches included a spring on an adjustable ball chain to keep the carriage floating above the workpiece, LED gooseneck lights for illumination (not pictured), and a shop-vac for dust collection (also not pictured, but absolutely critical--breathing fiberglass dust is not conducive to long-term health). Power was supplied by a 16V switching laptop adapter. I made a socket for Proxxon's 3-pin power connector using mini-banana jacks, which happened to be just the right diameter. (+) and (-) are clearly marked as the outer two pins on the plug; I'm not sure what the third pin is used for. Perhaps motor feedback.